An event like no other. On October 6th, at 11 AM, Puthir comes together with Seva Mela to include kids in celebrating the joy of giving. A unique and wholesome program to inspire, engage and empower the leaders of the next generation. Watch: A narrative musical play. A story that enthralled many an audience in Kathai Vidu takes the shape of a joyful musical. 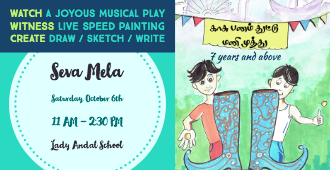 Directed by Krish and enacted by the members of the solver’s club, the audience will be taken on a thrilling joyride accompanied by live percussions by Vishva Barath and Satya Sharath. Witness: Puthir’s creative director and acclaimed muralist, Muhilan, will demonstrate the power and magic of art through speed painting. Create: Inspired by the events, our participants then take their materials to create a work of art to inspire the rest of the world to give. Engage: Every participant will get their own webpage on the puthir website to show case their art, publish their writing and engage with people that appreciate their art. The registration fees from this event will be donated to the NGOs that are a part of the Seva Mela. Within 30 days, the participants will have their own web page on the puthir website to show case their art, engage and inspire others. Participants must bring their own food or pay and eat at the food court at Seva Mela.